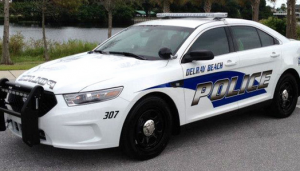 Four Hospitalized in Fatal Delray Beach Crash on U.S. Route I-95 | Schuler, Halvorson, Weisser, Zoeller & Overbeck P.A. Four people, including two children, were sent to the hospital after a fatal crash on U.S. Route I-95, in Delray Beach. Police are investigating a fatal crash on U.S. Route I-95 which left two cars badly damaged and sent four people to the hospital in Delray Beach. Emergency first responders were on the scene to attend to the injured victims after the crash. According to authorities, a Ford Edge was traveling northbound on U.S. Route I-95, south of West Atlantic Avenue, when it slowed down as it tried to navigate its way into an exit ramp. A box truck behind the Ford Edge, however, did not reduce its speed as it rammed into the rear end of the Ford Edge. The impact from the rear end collision propelled the Ford Edge forward and into a guardrail at the edge of the road. Two children – a 10-year-old boy and a 12-year-old girl – sustained multiple injuries in the crash. Paramedics placed the children in an ambulance for transport to the hospital. Additionally, a 5-year-old child suffered minor injuries in the crash; police say he was well restrained in a child car seat. Paramedics treated him on the scene. The driver of the vehicle and his front seat passenger suffered fractures and lacerations in the crash. EMS rushed them to the nearest hospital in an ambulance. Meanwhile, the driver of the box truck did not receive injuries in the crash. According to the Florida Highway Patrol, the driver was not intoxicated when the crash occurred. Police are investigating a mechanical fault as a factor in the crash.